GST: The same people that bring you the best bevels! 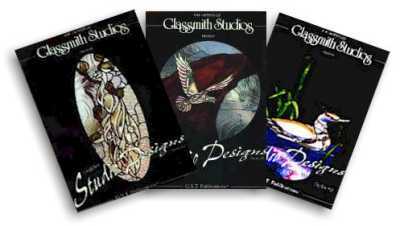 Glassmith Studios have teamed with GST Publications to produce some of the most unique designs. The specialized Bevel Clusters featured in each book or portfolio are GST's trademark. Sunshine stocks the full line of GST bevels, including their latest series in COLOR. 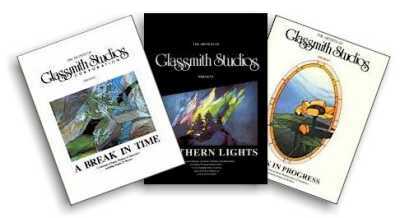 GLASSMITH STUDIOS has produced a series of the most imaginative pattern books! All three feature nature themes, lots of bevels plus outstanding photographs showing a good use of glass color and texture. All Books are $19.95 each. A BREAK IN TIME (#1179) takes up where Northern Lights left off. More entryway ideas, along with panels and suncatchers featuring birds, animals and flowers. Some fantasy themes with dragons and such, plus patterns for kids! Lots of bevels, too! WORK IN PROGRESS (#1185) is the newest in the series. Uses GST series bevels, including a dramatic panel using the Bird of Prey cluster (GST-10). Plenty of butterflies and hummingbirds in imaginative panels! (from left to right, Series 1, #1168, Series 2, #1169 and Series 3, #1167) each feature seven full size patterns featuring GST-Series bevel clusters. All designs are imaginative and eye-catching. Not your average pattern series! All patterns are full size, with full color photos.